A cancer survivor from York is appealing to members of the UK public to be aware of the signs and symptoms of pancreatic cancer, by taking part in a national awareness campaign, following her diagnosis four years ago. Jean has teamed up with charity Pancreatic Cancer Action to raise awareness of pancreatic cancer during Pancreatic Cancer Awareness Month, which takes place every November. 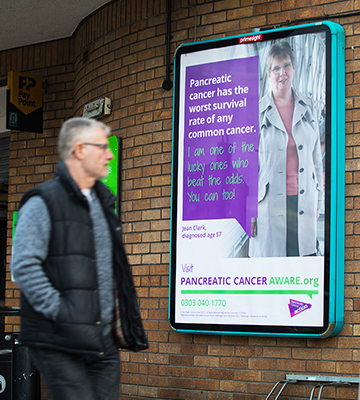 By appearing on bus stops, beer mats and sharing her story on the Pancreatic Cancer Aware website, Jean is a living example that early detection of pancreatic cancer can have a positive outcome. Jean hopes that by telling his story that she will raise the profile of this deadly cancer and encourage people visit their doctor if they are worried that they might have the symptoms. To read more patient stories please visit the patient story section of our website. 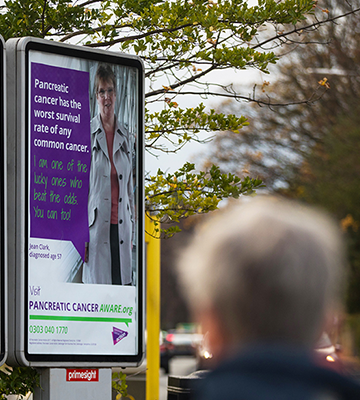 If you would like to find out more about the signs and symptoms of pancreatic cancer please visit the symptom’s page by clicking here.